Aloha! Welcome to our Hawaiian Luau! We have a wonderful feast prepared just for you! Flyers we posted all over the high school. Can you feel your mouth watering? I know I can! As I alluded to in my post about life as a clinical dietetics student, I am currently working in a high school cafeteria as part of my dietetics food service rotation. And, yes, I will say it: I have an increasing respect for the hair-netted lunch ladies of my youth. 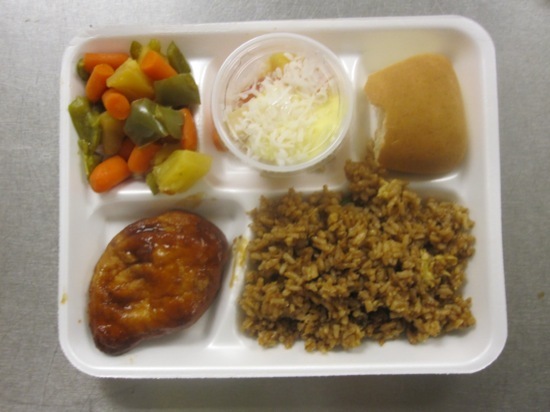 School food service is hard, yo. I think I have blisters on my blisters from chopping twenty pounds of carrots – I jest not. 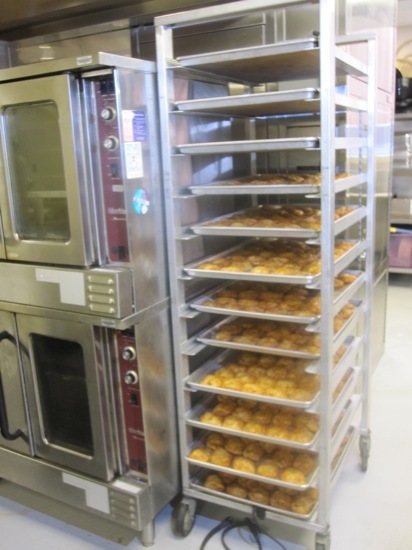 Our main project for this rotation was to plan a theme lunch for 400 high school students: students who are used to eating hamburgers, fries, and pizza dippers (cheese-covered bread dipped in marinara sauce). 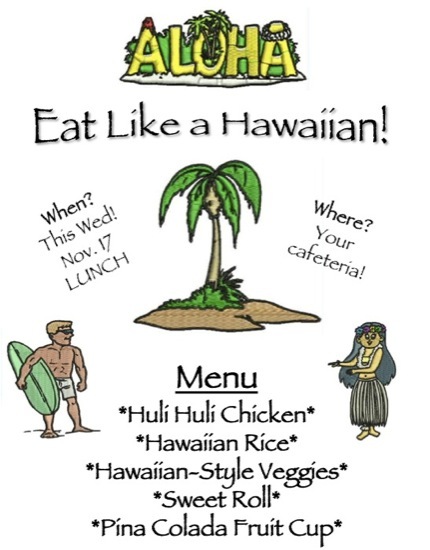 My fellow classmates and I arbitrarily chose a Hawaiian Luau theme because it was first in the list when we did a Google search for “theme meals”. We’ve spent the last several weeks preparing for this meal (in between stuffing hundreds of lettuce cups and laying out countless rolls). Today: SHOWTIME! As older and wiser folks in the school kitchen suggested, we prepped as many ingredients as possible the day prior. I think I opened about ten of these enormous cans with this old-school crank can opener. 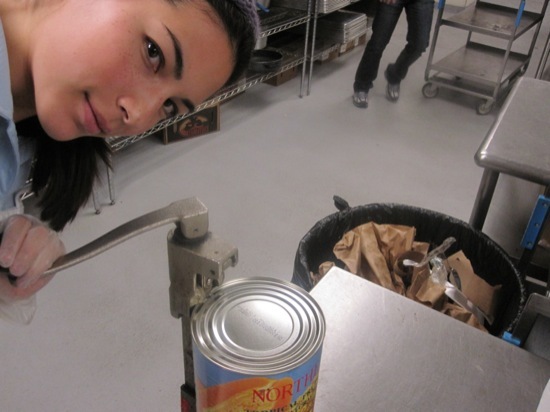 Since everyone else in the kitchen was busy, I tried to take a picture of myself with the can opener and subsequently showed off my awesome camera-aiming skillz. I can tell this is attempt #12 or so because I’m no longer smiling for the camera. Also, I love those random legs dashing around the corner in the upper right corner of the picture. Simple, I know, but with a $0 decorating budget and dollar store paper streamers the only available decorating aid, we did the best we could. I think the station turned out quite well. This morning, we arrived in the kitchen early and got right to work. 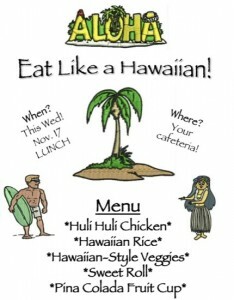 Check out our Huli Huli Chicken! How about some sweet rolls? 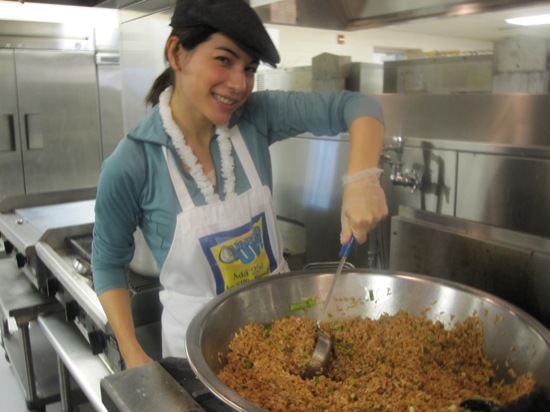 The hardest task was making the Hawaiian rice – having never cooked for 400 people before, I thought we could just make the rice on the stove as we would for four people. Yeah … no. 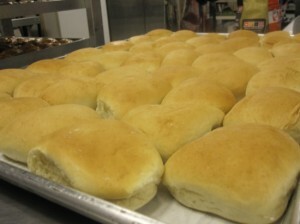 Just imagine SIX of those pans filled with rice, and you can see why I panicked a little. 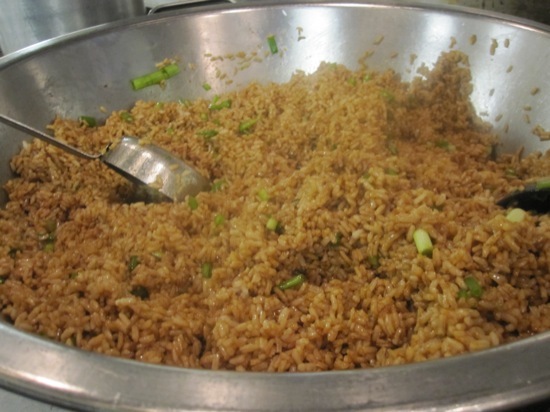 Luckily, the head cook came to the rescue and popped our pans in the oven to bring the rice up to the proper temperature. How did the kids like our meal? While a few high schoolers glanced at our station, wrinkled their noses, and walked away, a lot of kids were curious about these three strange girls who were blasting Hawaiian music in their cafeteria. Some of the kids were drawn to the new smells ( “It smells so good here!” ), and one girl leaned over the station and asked us to please, PLEASE cook more of their lunch food. Good to hear! Public school food service is particularly hard because the menus must be constructed within strict nutrition and price guidelines. 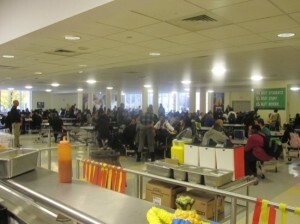 For example, this high school charges $2.50 per meal, which means that each meal needs to be made for around that much. It sounds easy, but it’s not: the students’ price must cover not only the food and the staff salaries, but also administration, utilities, paper products, water, etc, etc. And, what if a major piece of equipment breaks?? The budget gets more complicated when you consider government subsidies, free vs. reduced price vs. full price lunch, etc. Like I said: school food service is hard. Yo. 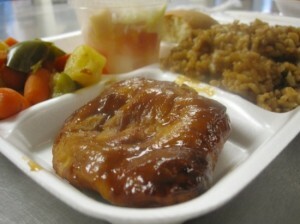 Perhaps I’ll do a future post about the school food service system in the U.S. versus pretty much anywhere else. So, how about a recipe? I thought about sharing our Hawaiian Rice recipe, but after hand-mixing 400 portions of rice, my arms hurt just thinking about it. So, Huli Huli Chicken it is! 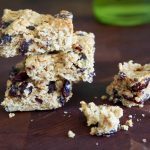 This recipe is simple (thank goodness! ): place chicken in pan. Mix remaining ingredients and brush over chicken. Bake or grill the chicken until cooked through (we baked our chicken). Before serving, heat the rest of the sauce and pour over the chicken. Note: You can also marinate the chicken in this sauce before cooking (which we obviously didn’t do). Make sure you heat the sauce up to >165 degrees F! Time to go recover with a good night’s sleep! 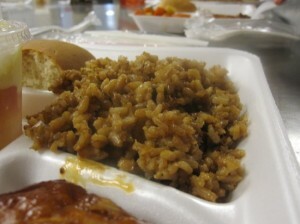 Q: What were your school lunches like? Did you bring lunch or buy it? What’s your favorite school lunch memory? You are so funny. First off, really diggin’ the hat…nice! 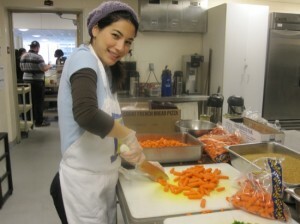 Second, having work in many kitchen’s myself, I never came across anyone chopping carrots with a smile like that. Congrats to you and your classmates for pulling off this feat. Hard graft indeed, especailly dealing with high schoolers. No wonder they want you to cook lunch from now on. Mad props for those skillz. My favorite school lunch memory, which I always bought by the way, no brown bags for Laz, was the massive food fights we’d have about once a month. Good times. um…can i just say that you’re the cutest lunch lady i’ve seen? seriously, with blisters on your blisters, and you can still pull off an adorable smile like that? kudos to you my friend for truly enjoying what you do. not to mention, dedication too. after about 5 shots, i would’ve given up on a self picture. super cute hat by the way, and those legs in your picture gave me a little laugh. i think you guys did really great with the decorating. you chose the perfect colours. even if it was low…no budget, it got the job done cause it drew attention. that’s all that matters. whether they liked it or disliked it, it served it’s purpose 😀 suckers…teehee. how was i ever a teacher? lol. not surprised you got asked to cook more of their lunch food. everything sounded and loked really tasty. my fave would probably have been the pina colada fruit cup as well. thanks for the Huli Huli Chicken recipe. i’ll have to bookmark this one. lastly, congrats to you, Bri, and Nicole for pulling this off with such success! high schoolers are really hard to please. i had really bad high school lunches. i would bring “junk food” from home or buy it at the nearby convenience store. buying a pretzel from the cafeteria would be considered one of my “healthier” lunches. my fave school lunch memories was when i was still in elementary and able to walk home for my grandma’s homemade lunches. grandmas rock! have a great week, dear. HUGS! Oh so neat!! 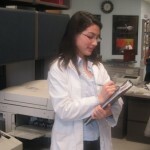 I wish I could have done something this unique and exciting during my rotations in my internship!!! Good for you for showing the students that healthy food can be tasty too. I agree with Lequan — you are the cutest lunch lady I’ve ever seen! 🙂 I am so impressed with you guys. I can’t even imagine cooking a meal for so many people, especially within the tight constraints that were set for you. 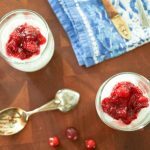 It’s interesting because in my field, we talk about school lunch from a public health perspective (wanting to increase healthy options, encouraging more local foods, making it affordable, etc), but it’s a lot “easier” for us to say all that since we’re not actually in the trenches and dealing with all the logistics. Even though I sort of knew complications existed, actually being able to see it through your post was eye-opening! I’d actually love if you did a post about the US school system vs. other countries — that sounds really interesting! Congratulations to you all for pulling off an awesome, high-schooler approved meal! 🙂 How long will you be working in the cafeteria for? Thanks for the compliment, Lauren! 🙂 It really has been eye-opening working in the trenches of a public school system, especially when comparing the U.S. school food service system (heavily influenced by politics and capitalism, of curse!) with systems in Europe and elsewhere. Amazing, really! The girls and I actually had our last day today – it was sad, but I am definitely ready to move on to something else! Have a wonderful day, Lauren! Awesome work! I had to do the same thing but in a hospital, and I think those higher schoolers were probably harder to please. I did Indian food and I had a large population of Indian doctors who were so excited to get Indian food for lunch one day. I just wanted a vegetarian meal. The nice part about that facility was that there was always one vegetarian menu option each day because so many employees were vegetarian. I love this!!! So cool! Thanks for sharing your experiences! Congratulations to you and your classmates…wonderful job! hungry kids that probably usually hate eating in the cafeteria. Haha, I know exactly what you mean, Faith! I wish my high school had hired me, too! 😉 Thanks for the sweet compliment – you are always so nice 🙂 Have a wonderful evening! Do you have a recipe for those Pizza Dippers??? You did such an amazing job! I can’t believe that lunch must cost $2.50 to make because that sounds like not nearly enough to pull something healthy together! I refuse to let Maya buy lunch at school because it’s only $1. That terrifies me! $1?? Oh … my … I would be packing my kid lunch every day, because I know all they would be getting for $1 at school is French fries and other processed foods, because that’s all schools can afford on a cheap budget. So sad. Good for you for not having Maya eat that! Have a wonderful day, Ameena! Look at you getting in the kitchen and just going for it. We never had to do anything like this in foodservice. I actually didn’t even have a school rotation. It looks like a challenge..but fun! WOW 400 students?! My goodness Jessie. No wondered why you got blisters from cutting carrots. 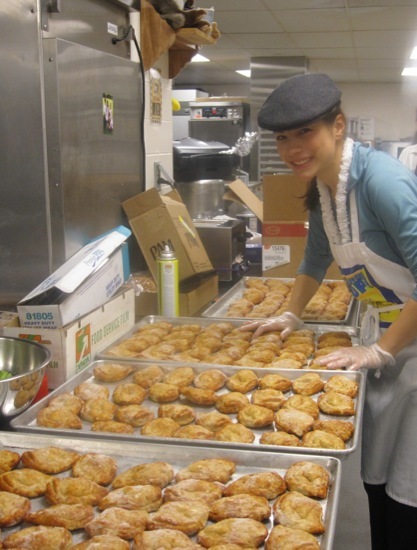 I volunteered at Farestart to make food 200 homeless(es) and i could feel an ache. You look hot, tho. So, keep smilling! 😀 Kudos to you and your classmates and I’m happy to hear that the students like you food! I would too! Oh Jessie this looks like so much fun! You guys did an awesome job! An old coworker of mine is now a lunch lady at her daughter’s school and she told me it is honestly the hardest job she’s ever had. But she loves it b/c she gets off on the weekends and summer, plus is home in the afternoon w/ her daughter. I always brought my lunch to school. My mom would pack it full of healthy, nutritional stuff. Everybody always thought I was weird and I would sometimes be embarrassed of it, but now I thank her for that! Instead of fruit roll ups and other “kid” things she expanded my palate to a bunch of really healthy foods and habits. Wow! I so enjoyed reading your post and seeing these pictures. I cannot imagine having to cook for so many people…and you three ladies did such a wonderful job. I would have felt very lucky to have been eating at school that day. Thank you for sharing, dear. I hope you have a beautiful Sunday! Wowza! I can’t imagine cooking so much food for so many people! And it looks delicious and nutritious 🙂 We never had lunches like that in my school cafeteria – it was always the typical fries and other junk. I always brought a lunch to school, but usually nothing more exciting than a sandwich. Hahah Jessie you look so cute with that hat!! And the random legs picture is just funny!! In Greece there is no lunch food offered at schools, only snack-like food during breaks, which ranged from (sort of) ok food like cheese and ham sandwiches, or simple cheese pizza to utterly wrong, like low-quality chocolates and sweets. All Greek kids eat lunch after school at home, so at least we would get home-cooked food for lunch 🙂 But imagine all the mums who needed to have food ready for lunch and dinner every day of the week!!! Thanks for stopping by my blog. I love this post. It’s great that you’re making your DI as fun as possible! 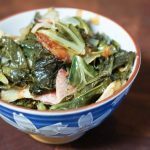 I was pregnant in my first trimester during my food service rotation and the smell of food killed me! Good memories. Good luck with the rest of DI! Jessica!! You’re awesome. How is that you look stunning even in a hair net? Dang. Huli-Huli Chicken. Tee hee hee! IT sounds funny. But looks absolutely delicious! I wish I had you as my lunch lady. Actually, no, I’d rather work along the lines with you, chopping and serving! Fantastic job Jessie 🙂 Well done indeed! Love the sound of the Huli Huli Chicken – you just gotta smile when you say it! 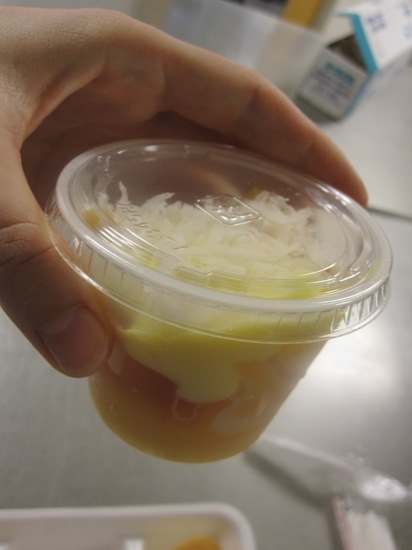 And the Pina Colada fruit cup, really, what’s not to love?? Woot woot! Congrats on your kitchen success! And if you ever want to come cook me some Hawaiian food…I’d be seriously thrilled. I learned a lot about school lunch regulations from watching Jamie Oliver and it is insane because some of them are so counterintuitive. Like needing two sources of carbs. Uhhhh what? i prefer two veggies thank you very MUCH. You did good though! Woot! You are having a good time in the kitchen. All smiles! Beautiful! And for a good cause – you are awesome! Thanks for such a wonderful post and keep up the good work! I always liked buying lunch, who doesn’t like a hot meal, but a lot of times I was ashamed to ask my parents for money for lunch. 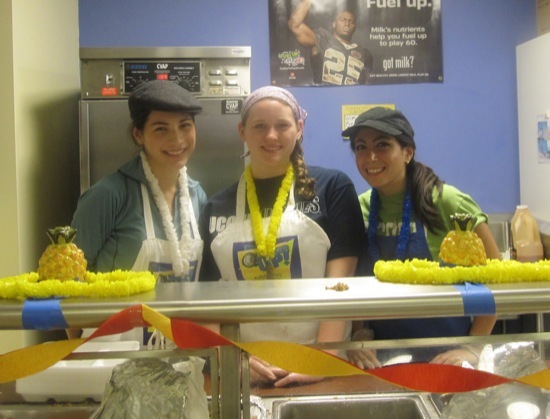 Your Luau theme sounds like it was so much fun for the kids! Man that is tough to have 2.50 cover all those costs. It used to be a dollar something when I was in elementary school, and even then I jipped them, gave them a dollar and they never recorded how much I owed. The meals I make now cost me about 2 dollars to make. 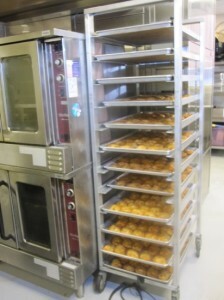 Man, tough cookies for public school food service. Oh Jessie. OH JESSIE. Firstly, THANK YOU so much for your awesome and lovely messages. They turned me into a big smiley face. Honestly, my favourite school lunches were pizza days and bagel days. The once-a-month days where everyone in the lunch program gets 2 big fat slices of delicious pepperoni pizza or one humongous toasted bagel slathered in a thick layer of full-fat cream cheese. No gastric ulcers, only guiltless deliciousness 🙂 I think a large part of my liking those days was just the sheer enjoyment of having a HOT lunch. (Usually, my lunches were these cold Pizza Pops that had been toasted the evening before and put in the fridge so that when I came to school the next day, eating lunch was like eating semi-frozen pizza-barf folded into a half-moon pita). 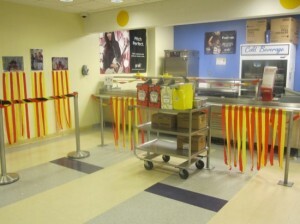 I AM a high schooler, and I don’t touch the food from my cafeteria. It costs $1.90 unless you go through the chicken sandwich and iced tea line. 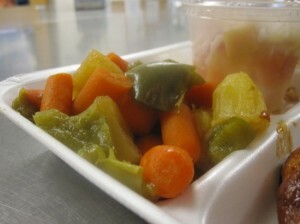 There is so much wanting in a school lunch that even my randomly combined, cold lunchbag food is preferable. And I’m not using tons of styrofoam and plasticware. I have to agree with you there – I remember the days of lugging my own lunch because the school lunch was … questionable. Thanks for stopping by, Alisha! I checked out your blog and I’m impressed with your thoughtful posts. Loved reading about your China trip – I just spent 6 weeks in Beijing and Hong Kong this past summer and had a terrific time. Keep up the good work! Thank you, Jessie! I haven’t been writing much but I enjoy it when I do!